Bulk Composition, Structure, and Dynamics of the Atmosphere. Photochemical Processes and Elementary Reactions. Chemistry of the Stratosphere. Chemistry of the Troposphere: The Methane Oxidation Cycle. Ozone in the Troposphere. Hydrocarbons, Halocarbons, and Other Volatile Organic Compounds. The Atmospheric Aerosol. Chemistry of Clouds and Precipitation. Nitrogen Compounds in the Troposphere. Sulfur Compounds in the Atmosphere. Geochemistry of Carbon Dioxide. The Evolution of the Atmosphere. References. Appendix: Supplementary Tables. Knowledge of thc chemical behavior of trace compounds in the atmosphere has grown steadily, and sometimes even spectacularly, in recent decades. These developments have led to the emergence of atmospheric chemistry as a new branch of science. This book covers all aspects of atmospheric chemistry on a global scale, integrating information from chemistry and geochemistry, physics, and biology to provide a unified account. For each atmospheric constituent of interest, the text summarizes the principal observations on global distribution, chemical reactions, natural and anthropogenic sources, and physical removal processes. Coverage includes processes in the gas phase, in aerosols and c1ouds, and in precipitation, as well as biogeochemical cycles and the evolution of the atmosphere. 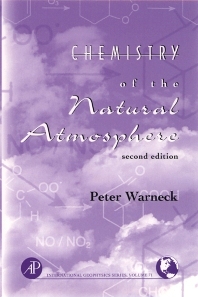 Chemistry of the Natural Atmosphere, Second Edition, will serve as a textbook for senior undergraduate and graduate courses, and as an essential reference for atmospheric chemists, meteorologists, and anyone studying the biogeochemical cycles of trace gases. Researchers and graduate students in atmospheric science, biogeochemistry. Since 1970 Peter Warneck has been associated with the Max-Planck Institut fur Chemie in Mainz, Germany. He is now retired with emeritus status. Between 1991 and 1993, he was the founding director of the Institute for Tropospheric Research in Leipzip, Germany.